The substrate that you use in your aquarium will become a vital part of your aqua eco-system. Its purpose is much broader than simply making the tank look nice. It also works to help the filter by creating a place for beneficial bacteria to build up, it acts as a safe place for any burrowing inhabitants you have, and has other different functions depending on different substrates. There isn’t a right or wrong answer when it comes to choosing the best substrate; it depends on what you want to get from your substrate, the inhabitants you want to keep in your tank, the water flow, and how thick you want your substrate bed to be. We’re going to take a look at the different types of substrate available for your marine tank, the pros and cons of each, and how to determine which is best for you. Most sand beds are made from ground up aragonite which is a crystalline form of calcium carbonate. The benefits of using a substrate like this are that it looks more visually pleasing and natural than a bare bottom tank, it’s also capable of biological waste processing – copepods and worms grow in sand and help to control nutrients. Another benefit is that aragonite helps to slightly buffer calcium and alkalinity levels, although not as much as other substrates. As substrate dissolves over time, it releases calcium and carbonate ions back into the water. You can buy different thickness grains of sand depending on what you want to achieve in your tank. If you’re looking for a deep bed of substrate, fine grain sand is probably the best choice. Using fine grain sand will prevent debris from building up. If you want a shallow sand bed, choose coarse sand which has a bit more weight so it’s less likely to get moved around by the water flow. Finer substrates are more preferable for low flow systems, or tanks with heavy macro algae growth. Fine sand is also good for creatures that like to sift in the sand such as sand-sifting diamond gobies and wrasses that like to burrow. 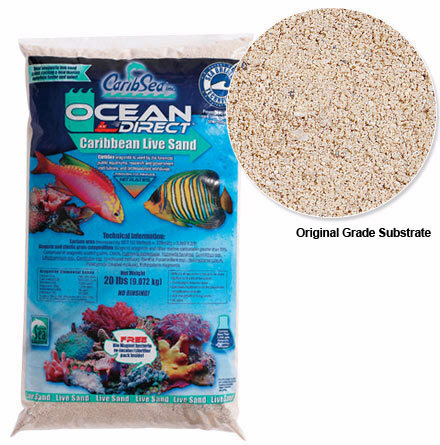 Crushed coral is probably the most readily available and cheapest substrates to buy. It is a porous material and provides a great are for beneficial bacteria to colonize. It is heavier than sand so is less likely to be blown around – if you have a high water flow, crushed coral may be better for your tank. Another benefit of including substrate is that other small creatures such as amphipods, copepods and worms will grow which are great food sources for your fish. A negative of crushed coral is that it can sometime contain sharp edges which are not ideal for bottom dwelling fish and smaller inverts that use substrate for their home. If you intend to have a number of powerheads in your tank, you’ll probably want a coarser and heavier coral which is more likely to stay still. Fish such as engineer gobies and jawfish need a coarser substrate so this would work for them; coarse substrate also works better for snails. Crushed coral does need to be replaced – you’ll see signs such as excessive cyanobacterial bloom which you can’t control, hair algae and an increase in nitrite levels. Some people choose not to use substrate at all for ease of maintenance. Having a bare bottom tank makes it very easy to keep clean, and also allows the water flow to be high which is great for SPS-heavy tanks. In having no substrate, there is nothing to disturb on the bottom and so the water flow can be set to high, so that nothing gets chance to settle on the bottom of the tank. The benefit of having fast flowing water in a bare bottom tank is that any debris is quickly removed through the filtration system and there isn’t chance for any bits of food or other debris to start breaking down in the tank and therefore producing ammonia, nitrites and nitrates. The other beauty of a bare bottom tank is that you can visibly see if any debris has built up, and clean it easily. Some people prefer the clean look a bare bottom tank provides, and over time coralline algae will grow over the base of the glass. The negatives of a bare bottom tank are that if you choose to have a high turbulence in water, to keep debris off the floor, this can cause rocks to fall and possibly crack the bottom of the tank. When rocks fall onto substrate, the impact is softened and dispersed across the bottom of the tank. If you don’t have a high water flow, you’ll have to use a siphon more often than you would in a tank that has substrate because piles of detritus will build up and look unsightly. Although bare bottom tanks look clean, some think they don’t look natural (although this comes down to personal preference). 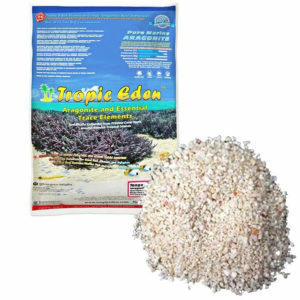 It is not suitable for lots of inverts and fish that need substrate to bury in such as Gobies, Shrimps, and Starfish etc. As we mentioned earlier, this is no one ‘best’ substrate for a marine setup, it comes down to what you’re trying to achieve in your tank, this fish you want to keep, the flow you’re trying to maintain and what you think looks more visually appealing. Robert is a Fishkeeping enthusiast with over two decades of experience with both freshwater and saltwater. His currently has a 120 gallon freshwater tank and you can read his blog at Fishkeeping World.